This tough course is not a race to worry about personal records. Race officials advise to add 20-30 minutes to whatever your normal marathon time . Just imagine taking those minutes off Jaimes finishing time. Both of our runners did excellent . The majority of my 14 years spent running were ran for nothing more than recreational purposes. Three years ago I started to have this far-reaching idea in my head that just didnt go away. It was approaching a point of obsession. I wanted to train for the legendary Boston Marathon, a preeminent event that has been going on for more than a century. To top it all off, the race day was going to be held on my birthday--the ultimate 38th birthday present, I thought. As expected, a race of such prestige is meant for the best and only the best. Before I can even dream of unwrapping this present, I first had to run a marathon with a qualifying time. Qualifying standards for my age division (35-39 years old) is 3 hours and 15 minutes or faster. That is a 7 minute and 30 second mile pace. To accomplish this goal, I had to wake up at 4:15 am, 6 days a week, and run in the cold, dark morning where every living soul was still sound asleep. This training schedule garnered 70 to 80 miles per week. The fact that I had to face the relentless odor of skunks almost every morning didn?t help either.Tuesday and Thursday were my high-intensity training sessions, involving speed workouts, repetition and sometimes mile intervals. At the end of these runs, my heart beat so fast that it felt as if it were going to leap through my throat. It was not easy getting up early in the morning. Being a single father, having a full time job and implementing an earlier bedtime was hard. But I knew that only dedication and discipline would help me achieve a 3 hour and 15 minute qualifying time. 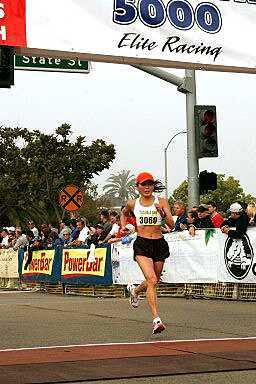 The goal was simple--fly to Sacramento, run the December 10, 2005 California International Marathon, and attain a qualifying time to run the 2006 Boston marathon. Victorious, I flew home with a solid qualifying time of 3 hours 2 minutes and 52 seconds. Mission accomplished. Boston April 17, 2006 --Happy Birthday: Here I was, in the suburbs of Hopkinton, Massachusetts, where 20,000 runners eagerly awaited the start of the race. Only one thing was in my mind--to finish the race with a time of sub three hours . All of the adrenaline building up for months made it difficult to resist the temptation to start out fast. Pounding on the early downhill stretch of the course, my legs became tired at Heart Break hill (between mile 20-21) -- a series of three increasingly steep inclines notorious for stealing whatever vigor a runner has left in them. Lesson learned, fast isnt always everything. After mile 23 I knew my goal of a sub-3 hour marathon was not to be. Finishing time: 3 hours 4 minutes and 24 seconds. Like your first date in high school or your first kiss in elementary, my first Boston marathon was a memorable and exciting experience. It was a tough and extremely hilly course. The deafening cheering from Weselley College, the Heart Break hill, and the crowd support were unbelievable. And to paraphrase our famous governor Arnold Schwarzenegger, Ill be back. Boston April 16, 2007: A few months before Boston 2007, I ran the Santa Clarita half marathon, finishing it in 1 hour and 21 minutes (6 minutes 15 seconds mile pace). Ive never felt more confident, prepared, and fit to finish sub 3. That Monday, however, was forecasted to have heavy rain and strong headwinds. I knew this would have a significant impact on my performance. Unfortunately, the weather is one of the many factors we have no control over. I finished with a time of 3 hours 2 minutes and 36 seconds (6:58 minute mile pace). Even though I didnt break 3 hours, this turned out to be my fastest marathon. Despite the cold and damp conditions, I managed to improve my finishing time from Boston 2006. Between now and Boston 2008, you better bet that Ill still be striving for that formidable and elusive sub 3 hour marathon. 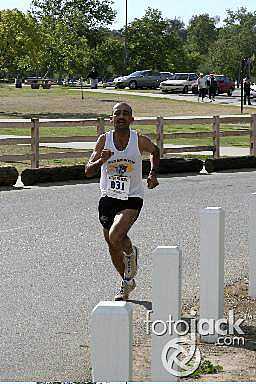 Upon searching on the Boston Atheletic Association 2007 results, I found that I was the 2nd place runner from Los Angeles. Just 34 seconds behind the first. Not bad at all. I recommend to any runner that has the chance to qualify for the Boston Marathon to participate. At least once in their lifetime anyway. Hey, I would have if the weather was'nt so terrible with a nasty brew of heavy rain, cold, and headwinds.
" Hey, is that's a real person behind us?" An Austrailian stud dances with Rosa. Chris Quesada 3:02:36 at Boston Marathon!!! Lets not forget to congratulate our very own Rafael Ramos who took first place overall at the 5th Annual Victory For Victims 5k with a blazing time of 15:38 (5:03 mile pace). There are a lot of young runners who have ability, but our Rafa who is now in the masters division shows he can still compete at the top level. Donna Competes at the "world's fastest 5k"
"The course is definitely not flat, and the reason they say it is fast is because there are so many "@#%$%^" fast runners running it" said Donna. Donna is very happy to finish in the top five of her age group . 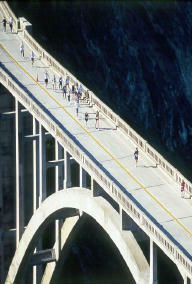 Members of the San Fernando and Hansen Dam Wild Mountain Runner club did the so-called NASA 14 MILER run. We start at the parking lot in Hahamongna Park and run UP 7.5 miles, and then come back. All of us ran the half marathon and then afterwards, Chris and Teyana cool down with a 10k. Mary came in 4th USA Women's Marathon Championship at the 111th Boston Marathon April 16, 2007 with a finishing time of 2:41:01 - Click on results and running carreer highlights below.